A lot of players were disappointed when Wilson decided to discontinue their beloved Wilson Six One 95 series in 2015-16. About two years later it came back in a white/red paint job. How does it play? Here is my Wilson Six One 95 racquet review. 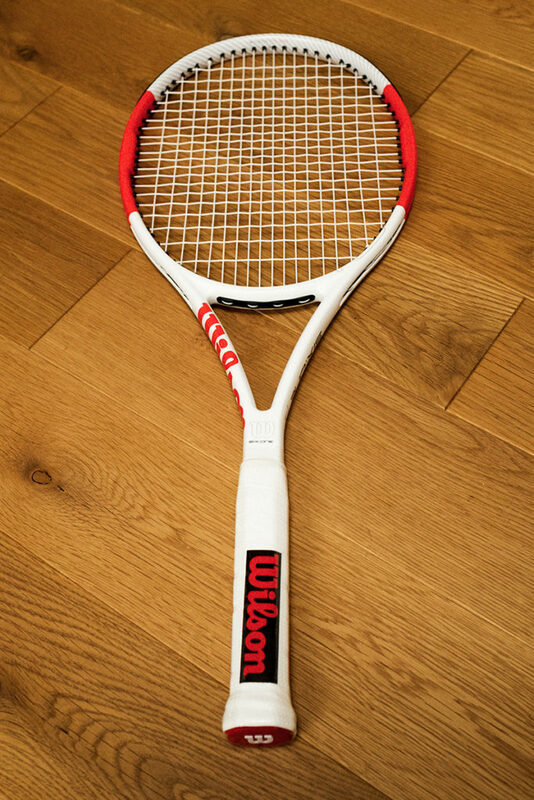 My first love in player racquets was the Wilson Six One 95 nCode 18×20. I used it for quite a while before I discovered racquetholism and hundreds of racquets later I still appreciate its plush and controlled response. Wilson has now re-released the Wilson Six One 95 (sadly, only 18×20 string pattern) in the heritage colors of red and white. Since I have played every iteration of the series, I thought it was time to write a Wilson Six One 95 racquet review. It is hard to tell if Wilson Six One 95 is still in fashion on the ATP world tour, because no one endorses this line anymore. 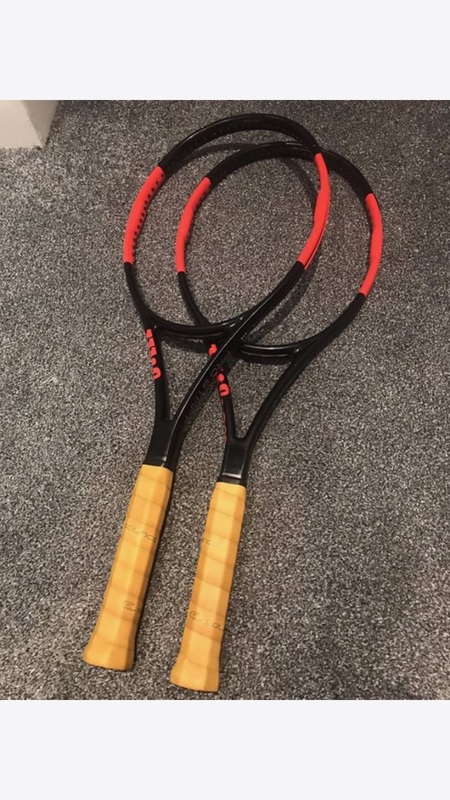 Despite the excellent new paint job, not one player uses it and instead most Six One 95 players endorse the Wilson Pro Staff 97 (see pic below from David Wimpenny who owns a pair), a racquet which very few professional tennis players actually use. The rising British player Kyle Edmund endorses the Pro Staff 97 along with Philipp Kohlschreiber (and many more), Del Potro for some reason endorses the old Wilson Burn FST 95 (he is notoriously picky with paint jobs for his Hyper Pro Staff and it took him a long time to switch from this k-Factor paint job!) only to name a couple of players. Wilson Six One 95 Racquet Review – How does it play? 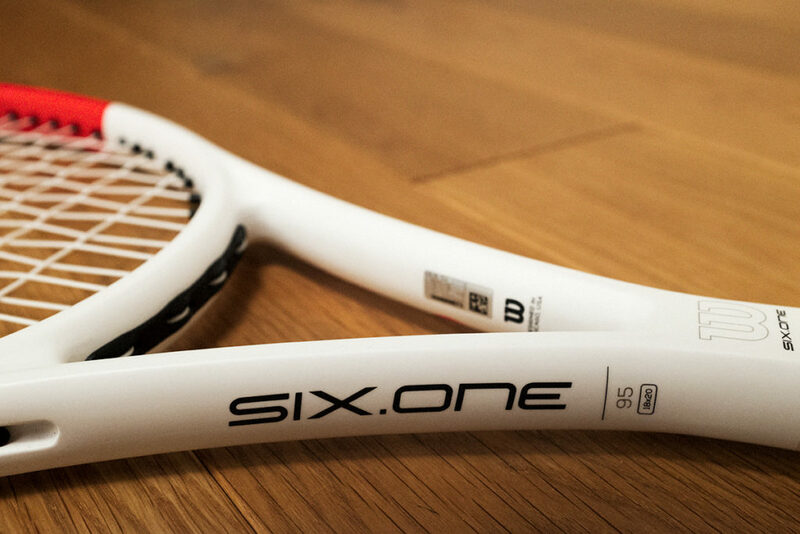 Since the Six One 95 version I have enjoyed the most is the nCode Six One 95, I was a bit skeptical of doing this Wilson Six One 95 racquet review. I did play a bit with this racquet before, but remember not liking it as much as the nCode. However, you change as a player and your preferences change too and with Luxilon Alu Power I thought this racquet was a joy to hit with. It is noticeably crisper than the nCode edition, but plays close to the recent BLX racquets. You need to have a full swing and solid technique to play with the Six One 95 and since I still have some issues with my knee, my movement is not a 100%, which makes it more difficult to use. I always thought the Six One 95 is quite an easy racquet to play with, but this is when my movement is normal and I feel fit. I currently appreciate a slightly bigger head size than 95 sq inches, but this might change once I get back in form. So I would say the racquet is definitely for advanced players. But compared to the Wilson Pro Staff RF97 Autograph (read my review here), it is definitely easier to swing and also slightly more comfortable so I think a lot of people who struggle with the RF97A, but want a hefty racquet, will appreciate the Six One 95. As you can see the balance is slightly less head light than the older Six Ones, the stiffness is a little bit higher and the swing weight too. This makes Six One 95 an excellent choice for advanced players! You get full-on control in a racquet that still packs a good amount of power. However, it will require a transition if you are coming from “tweener” racquets such as the Babolat Pure Drive (read my review) or Yonex DR98 (review here). So the Wilson Six One 95 specs are definitely built for advanced players. But if you are worried about the stiffness rating I would urge you not to let it fool you, the racquet is heavy and handles vibrations quite well. The first edition of the Wilson Pro Staff 6.1 had a stiffness rating of 72, but felt a lot plusher than that. You still need to be quite reliable when it comes to hitting the sweet spot however, few racquets allow shots close to the frame to be “pillowy”. POWER: 8/10 – More power than many 95 sq inch racquets. CONTROL: 8/10 – But with the tight pattern it manages to stay controlled. (16×18 version is a bit more erratic). MANOEUVRABILITY: 7/10 – For the weight the head light balance makes it easy to swing. TOUCH: 6/10 – I would not put this as a great touch racquet. You attack the ball with it. COMFORT: 7/10 – This racquet is definitely more comfortable than its stiffness rating. SPIN: 6/10 – You need to provide your own spin. GROUNDSTROKES: 8/10 – Really happy grinding from the baseline with this stick. VOLLEYS: 8/10 – Stable and fast at the net. Great for serve and volley players. SERVE: 8/10 – Thanks to the head light balance you can get some good racquet head speed. SLICE: 9/10 – The RF97A is a bit better, but this is a top slicing racquet. OVERALL: 8/10 – This is a top racquet for advanced players and it has been in fashion for more than 20 years. String it with a hybrid for more comfort and go out and murder the ball. Yes, it has a high static weight and swing weight so you need to make sure to be fit, have solid movement and technique, etc, but if you connect with the ball properly you are instantly rewarded. 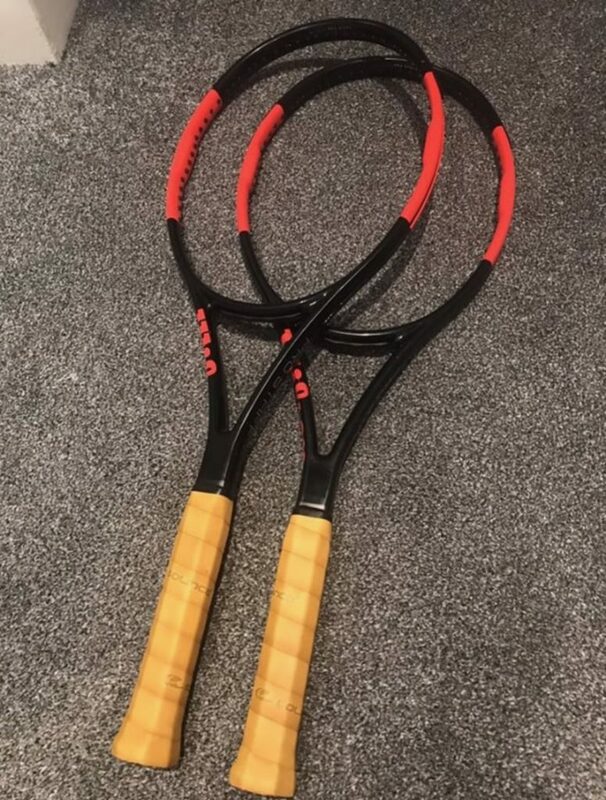 Just look at how Kyle Edmund plays with this racquet (not sure which version he uses)! Boom! In general, I am not sure if I prefer this slightly beefier and more powerful version or the softer nCode (I have two). They have some differences but share that nice, plow-through and good mix of control and power. I could easily take either one into a tournament and not blame the racquet for losing. PS. Now that I have tested this racquet I am selling it to make room for more racquet reviews and play-tests. Let me know if you are interested. DS. 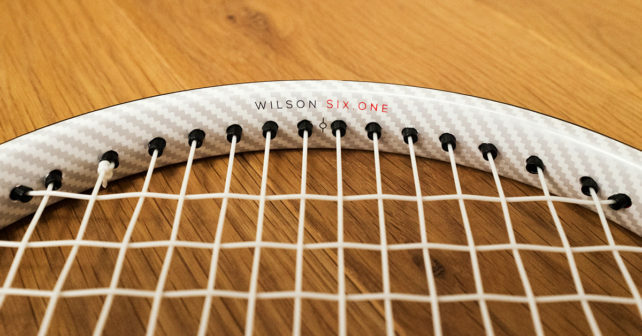 Have you tried the Wilson Six One? Which version is YOUR favorite? Let me know in the comments below. I played extensively with PS classic and N-Code 6.1, both in 16×18, and I have a couple 6.1’s has collectibles – I still take my N-6.1 18×20 of the bag from time to time, it’s a great doubles stick. The 6.1 are racquets for hard hitters and/or serve and volleyers. Not the best racquet in terms of feeling, not the easiest to move around, but in terms of cheer controllable power there’s not much racquets that can beat them. The 16×18’s have a bit more pop and spin access, the 18×20 is a punch volley machine, and hits a nasty slice. Fast feet, good technique and a strong arm are needed to move this thing from the baseline, it’s a sluggish racquet. Proper loose motion strokes will be rewarded with an heavy ball. Both versions are rock solid and handle power like a brick wall. Has long has you can get the racquet there, it handles big first serves easy. Currently, I have that NCode, an HPS 18×20 and a classic 16×18. I also have a clone by Slazenger, the Henman’s Pro Braided. I hit a couple shots with the first generation BLX, in 18×20. The classic has a very old school raw feeling, it might be my favourite, and the HPS is the one I like less. I’m still hunting for an elusive “K”, 6.1 fans usually mention this version has the a best one. How does the k factor version compare to the latest version as well as relative to all of the other versions of it? How does the KFactor version compare the most recent version and all of the other versions of the 95? Good question, Branko. The kFactor is really stiff and stable, close to the Hyper Pro Staff. The newer one is not as stiff and has a bit more “spring” from the string bed. I know some love the kFactor, but I don’t think it’s better than the new one. If you want massive plow-through however, the kFactor could be your friend. Regarding other versions, they’re all quite close, what differs is a point here and there head light balance and slightly different swing weights. The response from the stringbed is also slightly different. The most recent version with parallell drilling offers a somewhat bigger sweet spot in my opinion than the BLX 1 and 2 editions. This is all so subjective so you could be fine with any Six One 95. I tried the old Wilson nCode Six One 95 which my coach gave me, and I ended up breaking the string. I tried a lot of different racquets from the newer crop, and now I have to decide between Babolat Pure Strike 98 16×19 and the Yonex eZone 98 (store didn’t have the DR version). The specs you show are a copy from TW. They are not correct. On the racket it says 30.5 balance unstrung. Not 31. I havent played with other 6.1’s. I switched today from a PS97 as my hibrid setup just didnt last long enough in that 16*19 pattern (less than 2 hours as 6+ rated player). Loving it so far. With leather grip and overgrip I end up a bit high at 357 strung with 31,2 balance. But because it being so head light it maneuvers well. I’ve been playing with 6.1 95 since the very first model Classic. I have been playing with the 18×20 with parallel drilling for 3 years. Love the way this racquets hits. So plush and the plow through is amazing. You can absorb pace and direct it back with no problem. You can hit balls on a dime pretty much point and shot. You can flat or spin and it just goes in. Volleys are very clean and crisp. Now it is heavier than most all of these new modern racquets but you have something solid feeling in your hand when you hit the ball. I can’t stand how the newer racquets feel. Wilson please bring this back again and don’t stop making it. PLEASE!!! I have been playing with the PSC 25th Anniversary for about 1,5 years and i love everything about it. Great power/stability/comfort. Have you played with it. If so how does it compare to this ps95? I think it compares really well. It is basically the same mold, the PSC was a little more raw-feeling perhaps, but I do not think you would not notice a huge difference. Not that version anymore, I do have two nCode Six-One 95 in very good condition. They are a bit softer than the most recent edition. I am not a hundred percent if I want to sell them yet actually, but let me know if you are interested. Hi Jonas, thanks for the reply. Hmmm… I assumed I would get a notification through my email if I got a reply. May have to check my spam. This is my first time commenting. Thanks, you can keep them. I like it better when people get to have and play with racquets they really gel with. I don’t have any of that version but I think I can source some that are more locally to me. Really cheaply from people who don’t want them at all anymore if I remember correctly. I think the Six.One 95 is more a different-but-similar flavour racquet for me anyway. I have some K factor versions in an average condition when I bought them second-hand. I kinda like 18×20 string patterns but I feel this racquet doesn’t quite have enough touch on volleys. But still a really great racquet. I think they would still mean more to you than to me. But I’ll let you know my thoughts on the nCode version if I get my hands on one! The K-Factor version is great too, a bit stiffer and more powerful. Comfort and feel is a bit better with nCode in my opinion. Hei from Finland. Been playing with the last version before the remake for 5 years and although I consider myself anything but advanced I haven’t found a stick I play better with. The RF97 Autograph kills me after an hour, the regular one kills just my wrist (the one with CV feels plain dead). A Blade 98 is kind enough and provides easy power but with my full swing it’s just as easy to get the ball flying way out. So I’m out of ideas. I just turned 50 and though quite fit I know time isn’t on my side. Which perhaps strangely brings me to the question of tension. I also use Alu Power (thickest) but at the upper end @ 26 kg. What was the tension of your tester? What I’m wondering is if you think I could get a bit more speed on the ball with less trouble and without losing much precision by decreasing tension. I only have one six.one blx (my reserve is an older kfactor version) in use and since I these days only play once a week need restringing just twice or thrice a year. So if I get one of these remakes what would you suggest regarding tension, thanks. If you like the Six One 95, stick with that. You can always go down in tension to open up the power. I string my Six One 95s quite low. Around 22 kg with Luxilon Alu Power. 26 kg is very high for that kind of racquet! You could also go with a hybrid like natural gut in the mains at 25 kg and luxilon alu power in the crosses at 24 kg. That is a beautiful combo. So my recommendation is going down in tension. Also I would recommend stringing a bit more often. At least every 14 hours of play to get a fresh stringbed and preserve your arm.